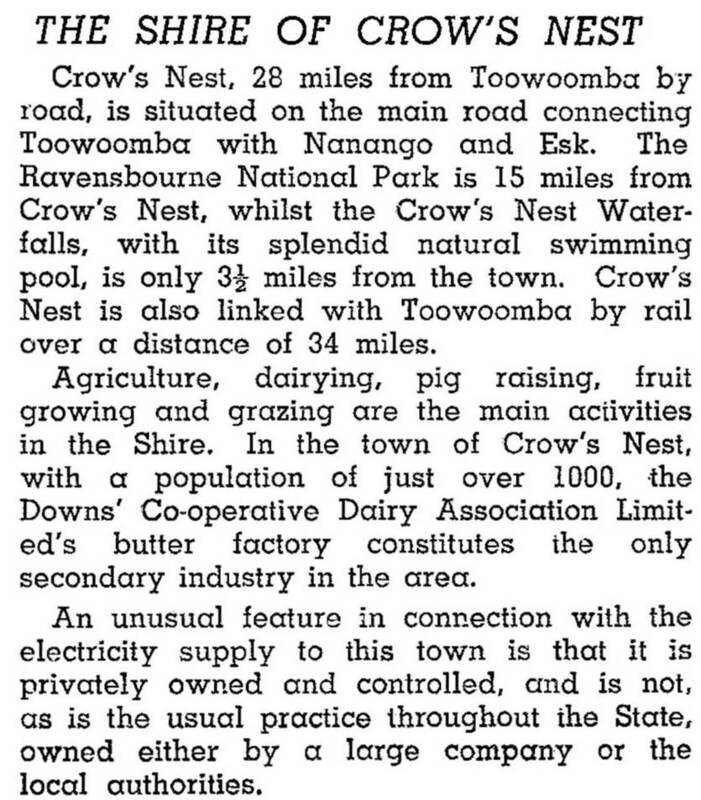 Crows Nest Shire, an area of 1631 sq km on the central Darling Downs and eastern ranges, is immediately north of Toowoomba City and extended nearly to Blackbutt. The shire's administrative seat was the town of the same name (see separate entry). In 2008 it was amalgamated with Toowoomba City and six other shires to form Toowoomba Regional Council. Dairying has declined in importance, but a diversity of farming pursuits has been sustained. In 1993 the main agricultural activities were meat cattle (35,000 head), pigs (13,000) and dairy cattle (8300). Urbanisation has featured strongly in the development of those parts of the shire close to Toowoomba: While Crows Nest Township's population increased from 1037 in 1981 to 1324 in 2001, Highfields, 12 km from central Toowoomba, exploded from 789 in 1986 to 3649 in 2001.